What The Faux: Is A-Case+ The Case for Malifaux? Malifaux belongs to the "skirmish game" category as you don't need dozens of miniatures to play it. We've all heard that many times and know it's not true. After a while you accumulate more masters and more models, and transporting your entire army becomes an issue. While you're definitely not going to need all of them but on the other hand larger hiring pool ensures greater flexibility during tournaments. 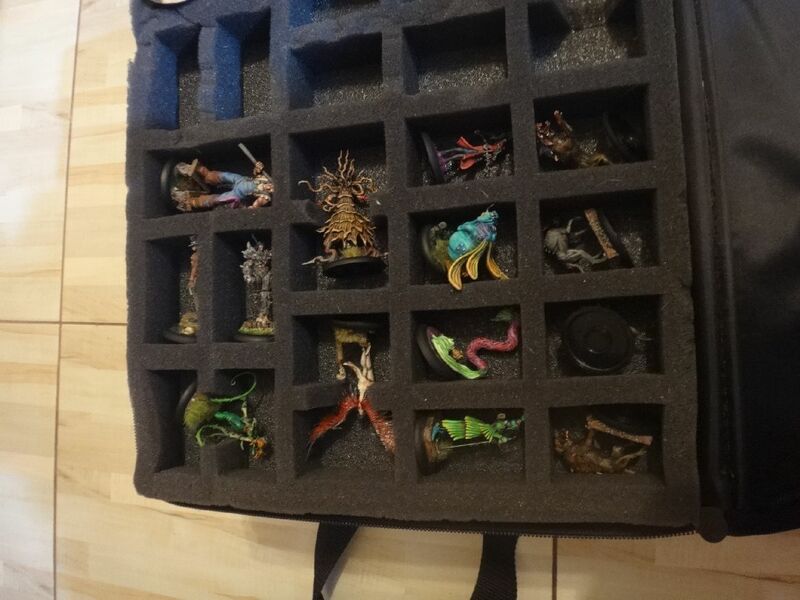 I've been using a dedicated Malifaux bag from Battlefoam for a couple of years. It's a very good product that allowed me to keep most of my minis safely packed. As my collection grew, it became more complicated. In theory, there are 36 slots for minis on 30mm bases in one foam tray. As you can see in the picture below, it doesn't always work this way. Wyrd miniatures are often very complex and take up much more space than that (Titania, Aeslin are good examples off the top of my head). Large miniatures pose another challenge. 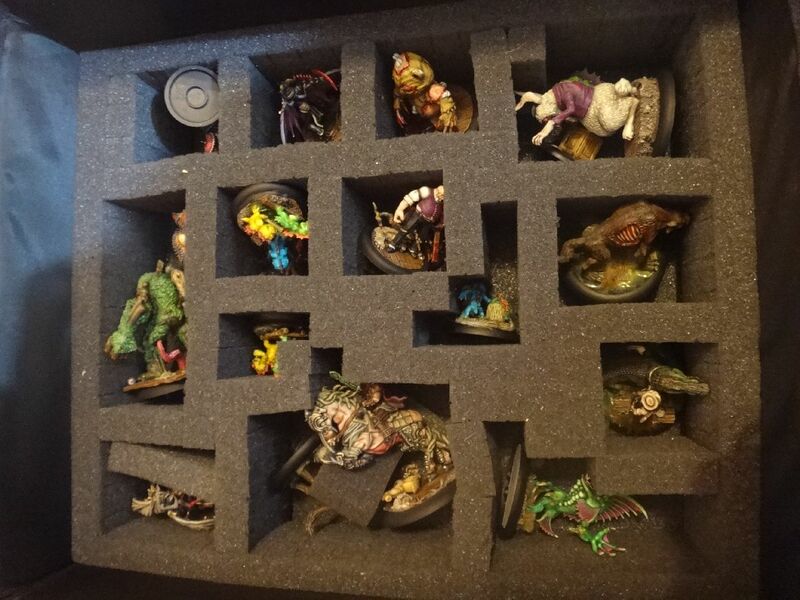 There is one thicker pluck foam tray that allows you to customize space and put in as many big models as you manage to fit. It is a nice solution but not the most efficient one as you run out of space after a while. 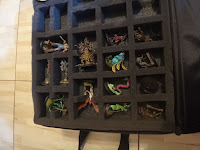 As a result, I ended up with one bag that was filled to 2/3 of its storage capacity and was never able to bring all my faction models to a tournament. Additionally, I had to bring another bag or backpack with me to make sure I have all the cards and markers I may need. 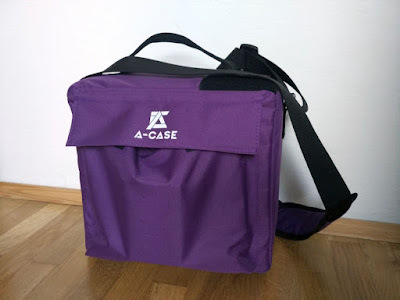 I started looking for other options and found an interesting Kickstarter campaign that features A-Case+, a wargaming carrying case with innovative magnetic solution. At that time I had no spare money to back the project, so I've only recently got in touch with the creator. It turned out that everything is available for preorder on the backerkit of the company (although the main focus is on finishing the remaining KS pledges). I contacted a representative of the company and received it after a couple of days. 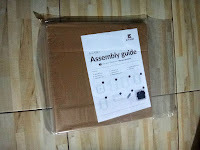 Everything was neatly packed and I started assembling my case. It was an easy process and I had no trouble in combining different elements. All the parts are flat to begin with and you just need to bend them into proper shape. No tools are required. Just take your time and make sure the angles of elements you bend are right. Also, I'd suggest setting the whole shelf on the floor and pressing on one edge when it rests firmly on even surface. If you try bending the edge just with your fingers, you may have to correct uneven edges after it's completed. 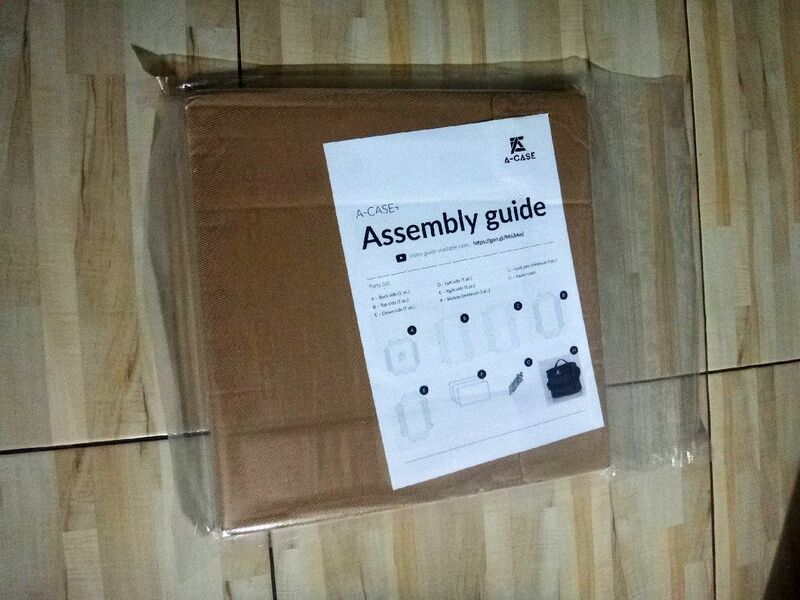 If you have trouble with it, the assembly instructions are available online in a video that presents all the steps clearly, it can be found here. 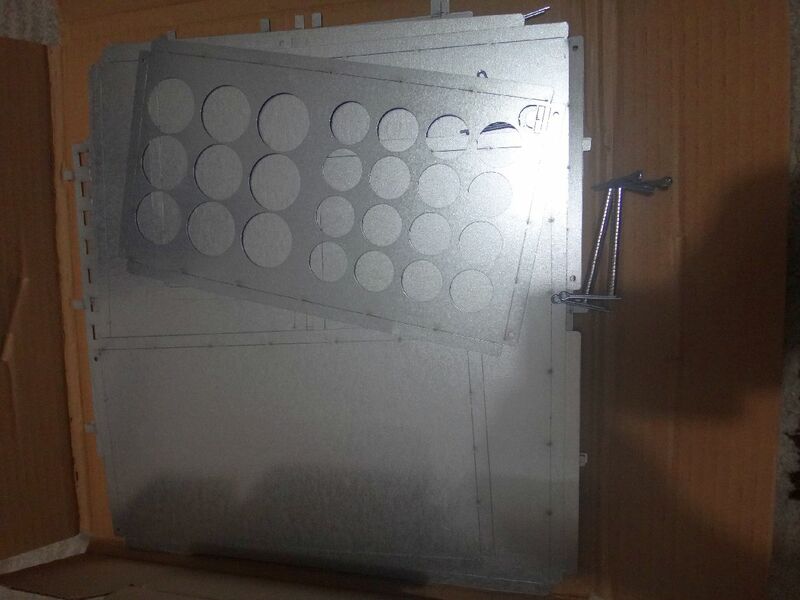 The frame is made of metal sheets. The structure is really solid once it is built properly. I was a bit concerned about the shelves, as they might simple move on their own. In order to prevent that from happening, a clever system of lock-pins that hold them in place is used. 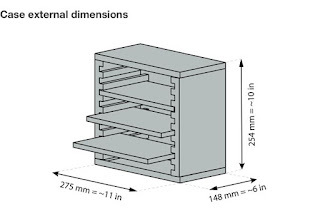 Specific dimensions can be seen in the picture below. What struck me immediately is how small it is compared to my old miniature carrying case. 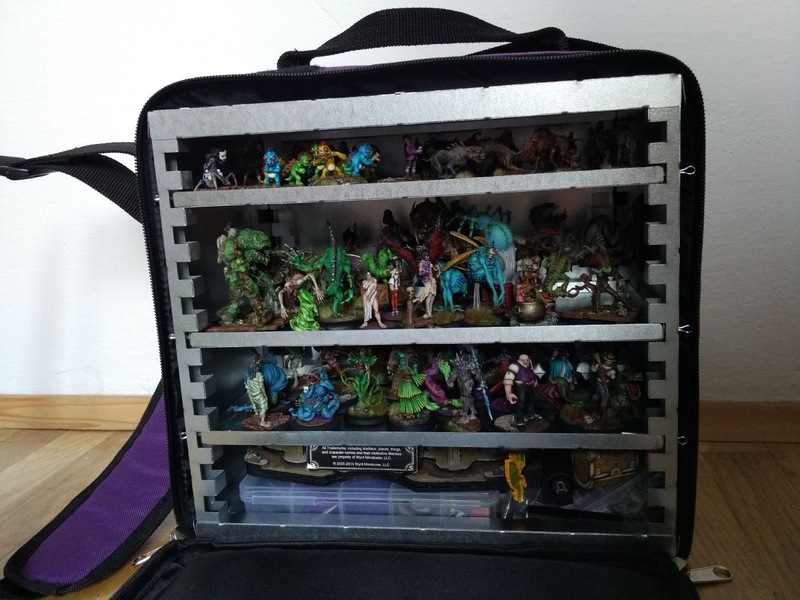 The important thing is that the case easily conforms to standards of carry-on luggage and you'll have no problem transporting your minis on a plane. 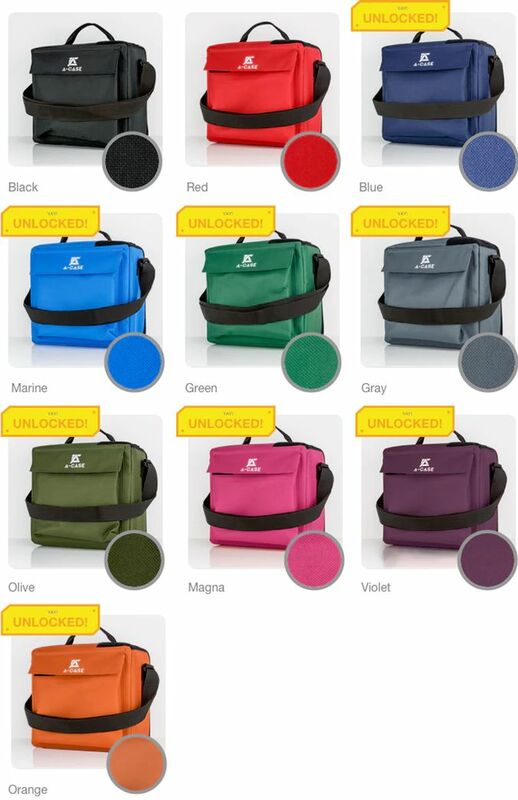 The material on the bag is water resistant polyester. 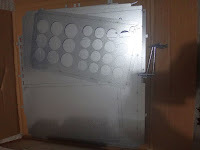 It is easy to maintain as it doesn't gather dust easily and doesn't absorb liquids (so for I've only tested it in light rain and the interior part was perfectly dry). What is important from the perspective of Malifaux player, all faction colors are available. I chose a purple one to go with my Neverborn. It is a very nice, slightly creamy shade of this color and looks even better IRL than in the picture. There is also a patch with velcro material, to which you can attach various tournament badges. That's not really a thing in Malifaux but I guess that might appeal to fans of some other gaming systems. The zipper is thick and has a solid feel to it, which is important, as it will definitely see a lot of use. The bag can be carried wither by a handle or an adjustable strap. Nothing fancy here, those are standard solutions. There is also a big pocket on one side. A big Ultra-Pro album I used to bring with me to tournaments doesn't fit in there but I managed to put my cards in a plastic deck box and upgrades in a small cardboard one and these fit in there. When it comes to storage, this is where some out of the box thinking shows. 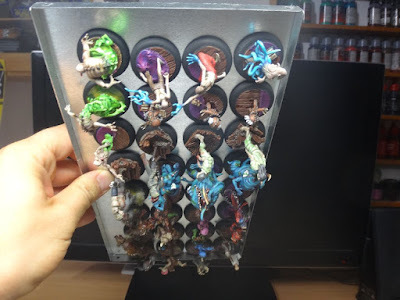 The miniatures are attached to shelves with magnets. In practice it means that you can fit more of them inside. What is more, they will be safer during transportation. 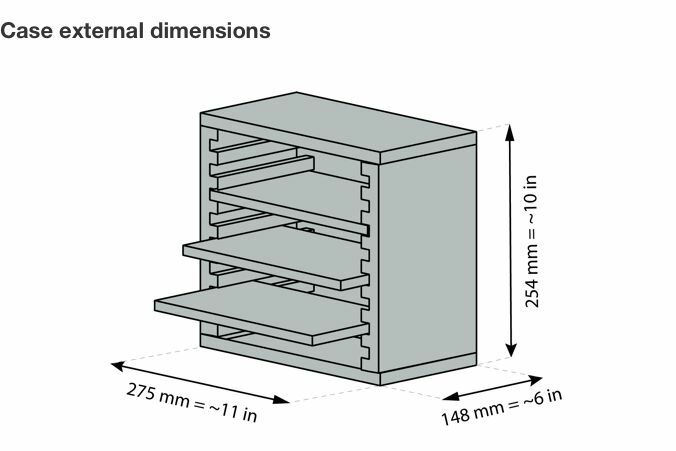 And since the entire interior structure is made of metal, you can even attach models to the sides if you need extra space. 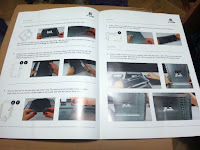 If the case is properly assembled, the shelves move with ease and taking one out is fast and convenient. 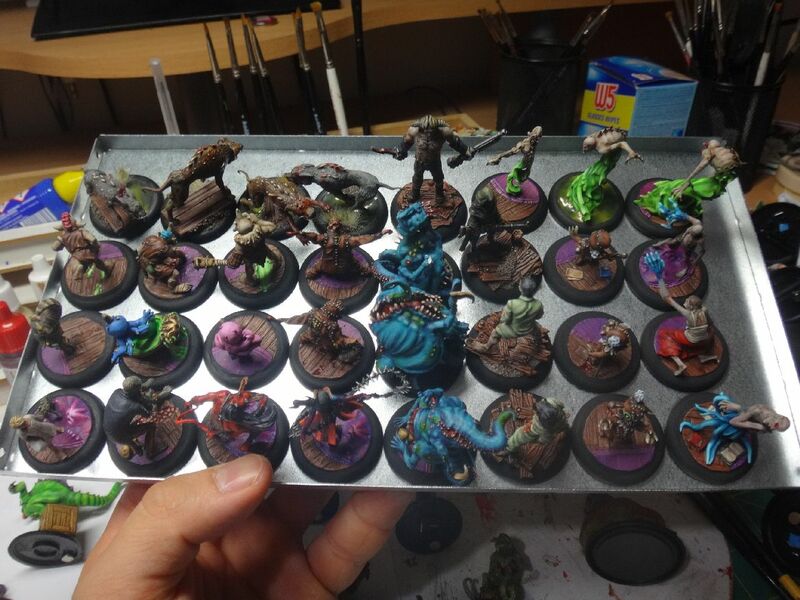 In a game of Malifaux you often need extra models that are summoned as the game progresses. This solution makes sure that adding these models to the table won't slow you down. The small bolts that are inserted from the side ensure extra safety as the shelf won't open and fall out on its own. Magnetizing your models is an easy. though time-consuming process. I was a bit worried about resin bases as drilling a hole for magnet in it was putting me off. Fortunately, another brilliant solution was introduced to deal with it. Sticky magnets are easy to use and hold the model in place inside the bag perfectly. They are available in sizes that match that of bases. They do increase its height a little bit, but it doesn't have any in-game effects as all the heights are used by their default value, regardless of the height of bases. If you need help with it, a very good video explaining the whole process in detail in available online here. 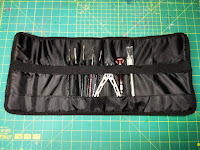 The option to carry your paints and other hobby supplies is also worth mentioning. 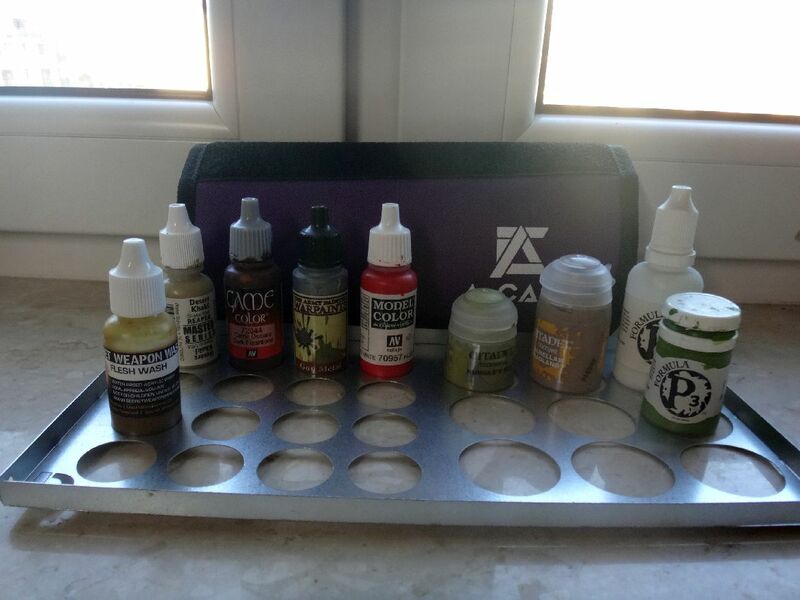 You can order additional shelf with slots specially designed to carry your paint pots. 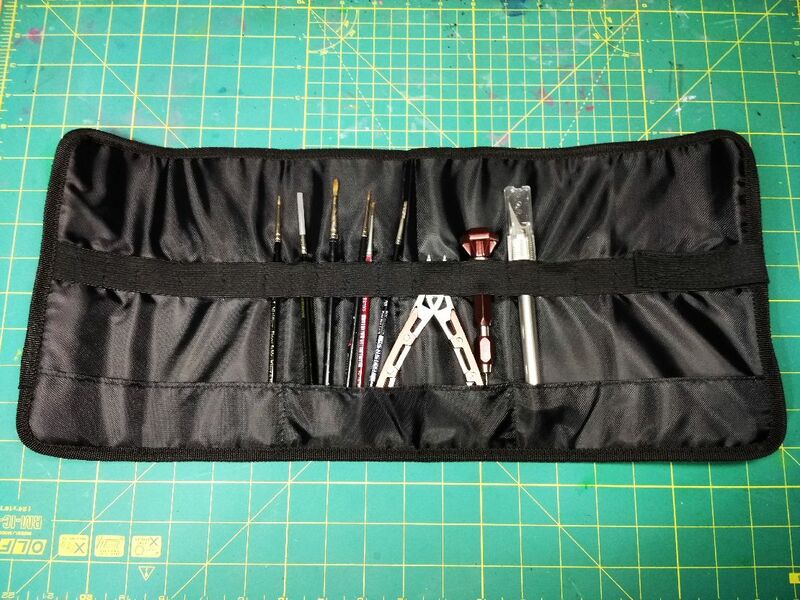 Moreover, there is also a special case (which can also be ordered in all available colors) for tools and brushes. 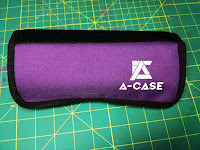 It's a neat solution as it will fit into the case easily and everything packed inside will be easy to access after unfolding. In the end I was able to put much more inside than into my previous bag. 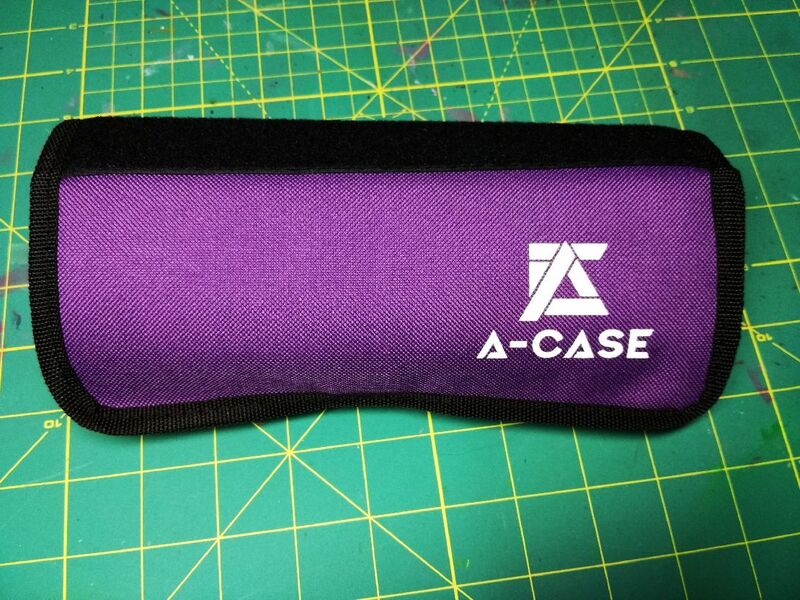 It was a pleasant surprise as A-Case is much smaller. Still, the possibility to fit more models one next to another on a single shelf provides a lot of extra space. I had no problem in putting 32 models on 30mm bases on a single shelf. What is more, I also put all my markers and tokens, tape measure, laser pointer, and all of the cards (I put them in a plastic deck box instead of big album that I used to carry separately in a backpack). There was even some space left for extra minis/gadgets in the end. It amazes me that such a small bag has such great capacity. And to wrap things up, time to answer the big question I put in the title of this entry. A-Case+ has incredible capacity. It's made of solid materials and has unique solutions that work really well. It's not a cheap product (it's not a cheap hobby as well...) but in the end buying it seemed justifiable for me as I was getting two products for the price of one. Now I no longer need to carry a bag and a backpack to tournaments. So, from my perspective, the answer is YES - this is the best bag for carrying your Malifaux minis. 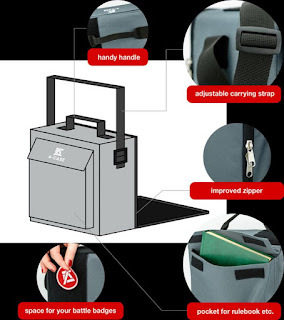 It ensures the best safety and the best storage capacity. You can't really ask for more. 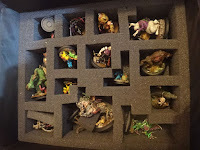 At some point my Malifaux collection will become much larger so I may have to look for new solution then. But I don't expect the creators of A-Case to rest on their laurels. They've launched a successful KS campaign and they have to start making plans on how to make their product even better than it is now. My experience with their product allows me to believe they will do exactly that and they will be successful. And one more thing - it may seem like I'm discrediting Battlefoam bag on purpose. That is not my intention. I really like that bag and it's served me well for a long time. However, my compulsion to BUY MOARRR minis meant that it's outlived its usefulness. I can still recommend it for those of you who don't expand their Malifaux collections too fast. I'll leave you with some pictures, enjoy! 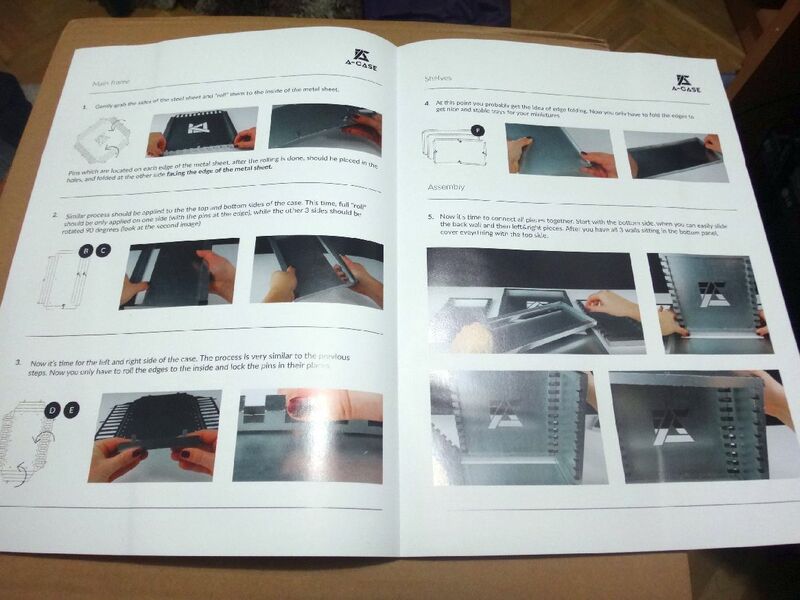 As you can see above, everything is neatly packed and the instructions are printed in color. Also, now it's official - the product has been tested "by animals". Jak widać powyżej, wszystko jest elegancko zapakowane, a instrukcje są wydrukowane w kolorze. Poza tym można już teraz oficjalnie powiedzieć, że produkt był testowany "przez" zwierzęta. ... and they don't fall off when you turn it upside down. ... i nie spadają z niej po przekręceniu do góry nogami. 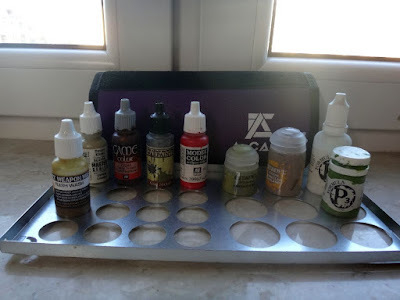 ...and a paintholder shelf will take care of your paints - as you can see in the picture above, bottles and pots from different companies fit easily. ...a specjalna półeczka zapewni miejsce na farbki. Jak widać na zdjęciu powyżej, buteleczki i kubełki z różnych firm bez problemu się na niej zmieszczą. I am still amazed by how much stuff I managed to fit into this small bag. Wciąż ciężko mi uwierzyć jak dużo rzeczy zmieściłem do tej małej torby. Malifaux to gra "skirmiszowa", do której nie potrzeba dziesiątek modeli. Wszyscy to słyszeliśmy i wiemy, że to nieprawda. W miarę jak powiększa się liczba masterów i figurek, transportowanie całej armii staje się wyzwaniem. Z całą pewnością nie wszystkie będą potrzebne, ale większy wybór pozwala na większą elastyczność podczas turniejów. 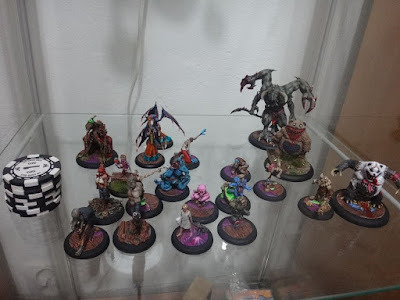 Od paru lat używam dedykowanej torby do Malifaux od firmy Battlefoam. Ten świetny produkt pozwolił mi na bezpieczne pakowanie większości moich figurek. W miarę jak zwiększała się moja kolekcja, stawało się to coraz bardziej skomplikowane. W teorii miałem do dyspozycji 26 miejsc na figurki na 30mm podstawkach w jednej gąbkowej tacce. Poniższe zdjęcie pokazuje, że nie zawsze działą to w ten sposób. Figurki Wyrda często są bardzo skomplikowane i zajmują znacznie więcej miejsca (Titania i Aeslin to dwa przykłady, które od razu przychodzą do głowy). Kolejnym problemem są duże figurki. Jest na nie szersza tacka z gąbką do wyrwania w odpowiednim kształcie, co pozwala w pewnym stopniu dostosować przestrzeń i wpakować tyle modeli, ile się da. To dobre rozwiązanie, ale nie jest też najbardziej wydajne, ponieważ i tak szybko zaczyna brakować tam miejsca. W efekcie miałem torbę wypełnioną w 2/3 jest potencjalnej pojemności i nigdy nie mogłem zabrać całej frakcji na turniej. Co więcej, musiałem zabierać ze sobą dodatkowa torbę lub plecak, żeby mieć pewność, że mam ze sobą wszystkie karty i markery potrzebne do gry. Zacząłem rozglądać się za innymi opcjami i trafiłem na ciekawą kampanię Kickstarterową, gdzie zbierane były fundusze na uruchomienie produkcji torby z innowacyjnym systemem magnesów o nazwie A-Case+. W tamtym momencie nie miałem wolnych funduszy na wsparcie projektu, skontaktowałem się więc dopiero niedawno skontaktowałem się z przedstawicielem firmy. Okazało się, że wszystko jest już do kupienia w pre orderze na backerkicie KS (chociaż głównym celem pozostaje pełne zakończenie kampanii KS). Zamówiłem swoją walizkę i już po paru dniach otrzymałem przesyłkę. Wszystko było elegancko zapakowane więc mokłem zacząć składanie torby. Cały proces był łatwy i nie miałem żadnych problemów z łączeniem poszczególnych elementów. Wszystkie części są płaskie i wystarczy tylko nagiąć je do odpowiedniego kształtu. Żadne narzędzia nie są do tego potrzebne. Wystarczy tylko podejść do tego na spokojnie i upewnić się, że zginając tworzymy kąty proste. Dodatkowo, sugerowałbym też układanie elementów na płaskiej powierzchni przed nagięciem brzegu. W przeciwnym razie można łatwo skrzywić krawędź, co tylko doda nam niepotrzebnej pracy. W razie problemów, szczegółowe instrukcje montażu są dostępne online w formie video, które w jasny i przejrzysty sposób pokazuje wszystkie poszczególne kroki. Cały szkielet jest zrobiony z aluminiowych arkuszy. Cała struktura jest bardzo solidna po prawidłowym złożeniu. Obawiałem się, że półki będą się suwać same z siebie, ale na szczęście działa tutaj sprytny system małych wyjmowanych bolców, które blokują ruch i trzymają je w miejscu. Szczegółowe wymiary widać na zdjęciu poniżej. Od razu zwraca uwagę to, że torba jest znacznie mniejsza w porównaniu do mojej starej. Co ważne - torba łatwo spełnia wymagania bagażu podręcznego, a więc nie będzie problemu z transportowaniem figurek w samolocie. Materiał na torbie to wodoodporny poliester. Łatwo go utrzymać w czystości, nie zbiera kurzu i nie wchłania płynów (póki co testowałem tylko na lekkim deszczu i wewnętrzna część była suchutka). Co ważne z perspektywy gracza Malifaux, dostępne są wszystkie frakcyjne kolory. Wybrałem fioletowy dla moich Neverborn. Odcień jest bardzo ładny, delikatnie kremowy, i w rzeczywistości wygląda jeszcze lepiej niż na zdjęciach z katalogu. Na torbie jest też spora łatka z materiału rzepowego, do której można przyczepić różne odznaki turniejowe. Akurat w Malifaux nie jest to istotne, ale pewnie fani innych systemów mogą być zainteresowani. Suwak jest szeroki i sprawia wrażenie solidnego, co jest istotne, bo będzie na pewno mocno używany. Torba może być noszona za doszyty uchwyt lub też na ramieniu na pasku, którego długość można regulować. I jedno i drugie to standardowe, sprawdzone rozwiązania. Z jednej strony mamy jeszcze dużą kieszeń. Duży album Ultra-Pro, którego używałem wcześniej nie zmieścił się do środka, ale po przełożeniu kart do plastikowego pudełka na deck i upgradów do małego tekturowego, byłem w stanie wszystko tam zmieścić. W tym miejscu możemy mówić o tym co naprawdę wyróżnia tę torbę. Figurki są mocowane magnesami na półkach. W praktyce oznacza to, że można zmieścić ich znacznie więcej w środku. Co więcej, będą bardziej bezpieczne podczas transportu. A ponieważ wewnętrzna struktura jest w całości metalowa, modele można doczepiać do bocznych ścian jeśli potrzebne będzie dodatkowe miejsce. Po prawidłowym złożeniu półki wysuwają się bez wyraźnego oporu, wyciągnięcie pojedynczej jest szybkie i bardzo wygodne. Podczas gry często przywołuje się dodatkowe modele, a takie rozwiązanie znacznie przyspieszy dostawianie ich na stół. Małe bolce wciskane od boku w szufladę zapewniają dodatkowe bezpieczeństwo, ponieważ dzięki nim szuflada nie wysunie i nie wypadnie z torby. Przyklejanie magnesów to łatwy, choć czasochłonny proces. Patrzyłem z pewnym niepokojem na żywiczne podstawki, nie zachęcała mnie perspektywa wiercenia w nich otworów. Na szczęście wprowadzono tutaj kolejne świetne rozwiązanie. Przyklejane magnesy są łatwe w obsłudze i idealnie trzymają model w torbie. Są dostępne w rozmiarach, które idealnie pasują do tych używanych w grze. Minimalnie zwiększają wysokość modelu, ale nie ma to żadnego wpływu na grę, ponieważ w Malifaux wysokość figurek jest określana domyślnie, wysokość podstawek nie ma tutaj żadnego znaczenia. Jeśli przyklejanie magnesów sprawia komuś kłopoty, można obejrzeć to video, które w bardzo przystępny sposób wyjaśnia jak się do tego zabrać. Warto również wspomnieć o możliwości przenoszenia w walizce farbek i materiałów hobbystycznych. Można do tego celu zamówić dodatkową szufladę z otworami zaprojektowanymi specjalnie do pomieszczenia kubełków z farbkami. Co więcej, dostępna jest specjalna torebka (również dostępna we wszystkich frakcyjnych kolorach) na narzędzia i pędzle. To sprytne rozwiązanie, ponieważ całość bez problemu zmieści się w torbie, a dostęp do narzędzi hobbystycznych będzie łatwy po rozwinięciu. A więc jak to wszystko wygląda całościowo? Ostatecznie byłem w stanie wsadzić do środka dużo więcej niż do mojej poprzedniej torby. To była miła niespodzianka, zwłaszcza, że A-Case jest znacznie mniejsza. Możliwość ułożenie podstawek jedna obok drugiej zapewnia znacznie więcej miejsca. Nie miałem żadnego problemu z ułożeniem 32 figurek na 30mm podstawkach na jednej półce. Co więcej, włożyłem też do torby wszystkie markery i tokeny, miarkę, wskaźnik laserowy, oraz wszystkie karty (włożyłem je do plastikowego pudełka na deck zamiast do dużego albumu, który dawniej nosiłem osobno w plecaku). NA koniec pozostało nawet trochę dodatkowego miejsca na dodatkowe figurki/gadżety. To naprawdę niesamowite, że tak mała torba ma tak dużą pojemność. I jeszcze jedno, czas odpowiedzieć na wielkie pytanie z tytułu tego wpisu. Torba A-Case+ ma niesamowitą pojemność. Jest wykonana z solidnych materiałów i są w niej zastosowane unikalne rozwiązania, które świetnie sprawdzają się w praktyce. Nie jest to tani produkt (nie jest to tanie hobby...), ale ostatecznie wydanie na nią pieniędzy wydawało mi się uzasadnione, ponieważ w praktyce dostałem dwa produkty w cenie jednego. Teraz nie muszę już nosić na turnieje i torby, i plecaka. 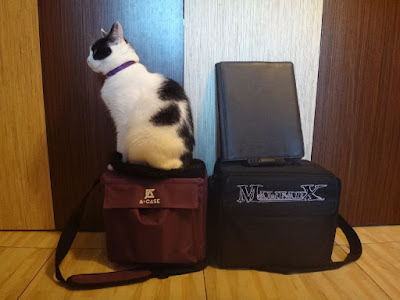 A więc, z mojego punktu widzenia, odpowiedź brzmi TAK - to jest najlepsza torba do transportowania figurek do Malifaux. Zapewnia najlepsze bezpieczeństwo i największą pojemność. Ciężko wymagać więcej. W pewnym momencie moja kolekcja Malifaux będzie jeszcze większa i będę pewnie musiał rozejrzeć się wtedy za nowym rozwiązaniem. Ale też nie spodziewam się, że twórcy torby A-Case spoczną na laurach. Przeprowadzili udaną kampanię na KS i już teraz powinni zacząć planować, jak jeszcze mogą ulepszyć ich produkt. Moje doświadczenia z tą torbą pozwalają mi wierzyć, że zrobią to z powodzeniem i efekt końcowy będzie jeszcze lepszy. I jeszcze jedna rzecz - może się wydawać, że celowo źle oceniam torbę Battlefoam. To nie jest moja intencja. 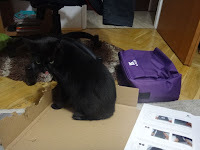 Torba Battlefoam bardzo dobrze mi służyła przez długi czas. Jednak moje uzależnienie od kupowania coraz większej liczby figurek oznaczało, że w pewnym momencie nie mogła już pełnić swojej funkcji. Wciąż mogę ją polecić jako rozwiązanie, które do pewnego momentu będzie się świetnie sprawdzać. Na koniec zapraszam do obejrzenia zdjęć powyżej. Bardzo dobry, pełny opis, można sobie wyrobić rzeczową opinię nt tych toreb. Niestety - nazwanie ich "nie tanim produktem" jest poważnym eufemizmem. Sam przymierzałem się do kupna, ale cena zachęciła mnie do skonstruowania ekwiwalentu samemu.